Campbell Campbell Edwards & Conroy, P.C. 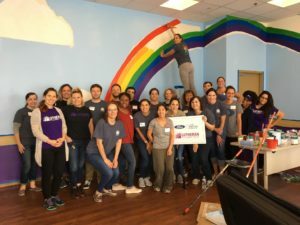 Helps Beautify New Homeless Shelter in Philadelphia During Ford’s LAW’s Global Day of Service – Campbell Conroy & O'Neil, P.C. Campbell Campbell Edwards & Conroy and Duane Morris attorneys spent Ford Motor Company’s Legal Alliance for Women’s (LAW) inaugural Global Day of Service painting the Bright Spaces and residence rooms at Jane Addams Place, Lutheran Settlement House’s new homeless shelter in North Philadelphia. CCE&C also donated many new and gently used clothing items and toys that will be put to good use when the residents move into the shelter and their newly painted rooms on Monday. Members Lynne Ingram, Meg Porth, Emily Rogers, and Kate Wang, and Associates Amanda Carmona, Erin Grewe, Yasha Shahidi, and Ari Sliffman took part in this service project on September 27, 2018.